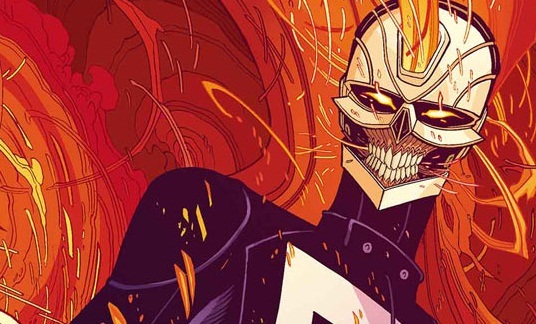 It's finally been confirmed that Ghost Rider is going to appear on the show Agents of S.H.I.E.L.D., but it's not the version that a lot of us grew up with. I must say that I'm not that impressed with the look of the new Ghost Rider. I hope that they go with the original look of the character rather than going with this new look. From the teaser that was put out at SDCC, it seems like they just might do that. The version that was ultimately decided upon was the latest incarnation of the character. This versions name is Robbie Reyes. He's a down on his luck Latin American living in a seedy, crime ridden part of East Los Angeles. He works at Camelo's Auto and Body to try and raise money to move him and his handicap brother, Gabe, to a better area and live a better life. He tries to speed up the process by taking one of the muscle cars that he's been working on at the shop, and entering it into a street race to win a large sum of cash. During the race, Robbie is chased by who he thinks are the police, but winds up being armed thugs trying to get back the drugs that are in the trunk of the car. He turns down a dead end alley, gets out of the car, and the thugs fill him full of holes, turn him into Swiss cheese and torch the car. Now this is where the interesting, and somewhat hard to follow part of the story comes in. The car turns out to be haunted. As Robbie lay there in a pool of blood, and the car engulfed in flames, the ghost transfers itself from the car and into Robbie's lifeless body, thus creating the All New Ghost Rider. I say it's hard to follow because it's in no way mentioned that the car is haunted, but we're supposed to figure that out from a couple of obscure panels. It might not have been hard for you to understand, but it was for me. And just to clear up the key issue notes above, the Hell Charger is the haunted car that the new Ghost Rider drives. Gone is the flaming motorcycle, and it's replaced with a flaming Dodge Charger. For a first appearance of a new character, this comic wasn't overly printed, like a lot of them seem like they are today. According to ComiChron.com, the initial print run was only 50,210 copies. That seems like a lot, but I don't know if that's only for the first print, or if it includes all of the variant and dealer incentive covers out there too. 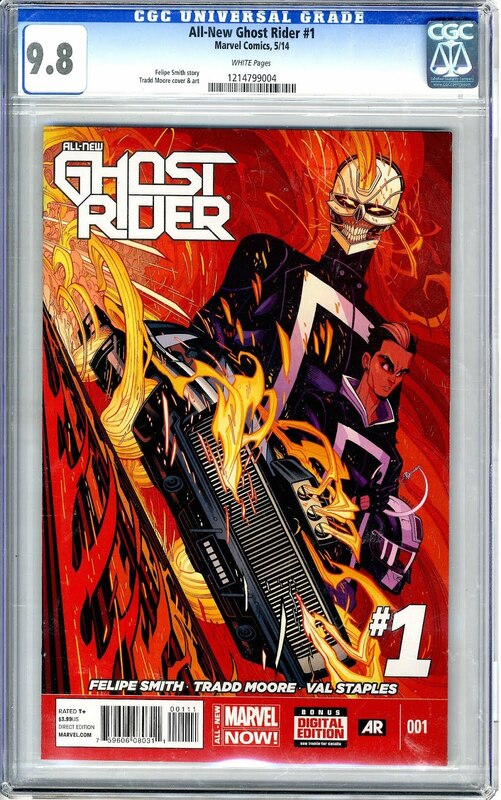 I would have thought that Ghost Rider was a popular enough character to warrant a higher print run than that, but I guess I would have been wrong. Looking at the CGC census is very confusing. There are listings for the variant covers, and this issue has a lot of them, but I can't find any info on the non variant, first print cover on there anywhere. However, the census numbers are pretty low for the covers that are listed. In all, there are only 80 total copies graded for all of the variants. After seeing those numbers, it's no surprise to me that there aren't a lot of already graded copies in the market as of now, but there are quite a few raw copies. Most of these copies are on eBay of course. Since the announcement that Ghost Rider was appearing on Agents of S.H.I.E.L.D., values for this comic have seen an instant, and significant rise. As you can see,there haven't been a lot of sales for already graded copies, but prices for CGC 9.8 NM/M jumped from $50 on July 2nd, all the way up to $130 on July 23. The one 9.6 NM+ sale for $9.99 was back on March 10. I'm sure that the next sale for that grade won't go for that low of a price. The variant covers have even less sales data that the original cover, so it's hard to say if those will have the same bump in value or not, but I'm willing to bet that there will be. There are a lot of variant hunters out there after all. Right now, you're best option might be to buy a raw copy and have it graded since there are far more raw copies in the market right now, and most of them are probably in high grade. It could also yield the most profit, but only if you have a good eye for detail and can accurately judge the grades of raw comics. There is a big difference in value from a 9.8 NM/M to a 9.6 NM+. But if you decide to buy an already slabbed copy, you can probably still find a best offer or talk a dealer down to your price range at your LCS or at a convention.